From football fame to a prison term: how the ex-Sydney Swan is rebuilding his life. For more than a decade Daryn Cresswell gave his all for the Sydney Swans. Over a career spanning 244 games he was smart, strong, unflinchingly brave and unwaveringly loyal. But when the curtain fell, things changed fast. Embroiled in a world of fast earns, chronic gambling and entangled in a web of lies, Cresswell lost everything – his wife, his money, friendships and, in the end, almost his life. In a very real way it was only jail that could save him. In Crezza, Daryn tells his story, one of hard-earned highs and self-inflicted lows. It’s the story of a driven man who risked everything and lost. It’s also the story of a man who clawed his way back. Go HERE to read an extract and/or to buy a copy from the usual outlets. Contact me at mattwebberwrites at gmail dot com if you want a copy and post it to you. $25 all in. Everybody screws up. Of course they do. But no one screws up like a modern-day gladiator. We read about footballers every day. We celebrate their physical feats, their freakish athleticism, their guile and poise on the park. We rejoice in their glories. We feel their hurt. We share their tears. But more and more, football is not enough. Nowadays, off-field behaviour steals more than its share of column space. Private lives are no longer. Mistakes are magnified. And we in the outer are voyeurs. We delve for details. We are judge and juror. Sometimes we are executioner. When footballers stumble, our damnation is usually ruthless. Crossing all four football codes, The Bad Boys of Footy not only shines a critical light on a host of contemporary miscreants who’ve tripped up, boozed, lied, cheated, whacked, kicked and bottomed out, it also holds a mirror up to us as sporting fans as we consume the failings of those we hold up as heroes. Go HERE to read an extract. Go HERE to buy a copy. Available in the nice-smelling traditional paper format and also online. Contact me at mattwebberwrites at gmail dot com if you want me to sign a copy and post it to you. $30 all in. 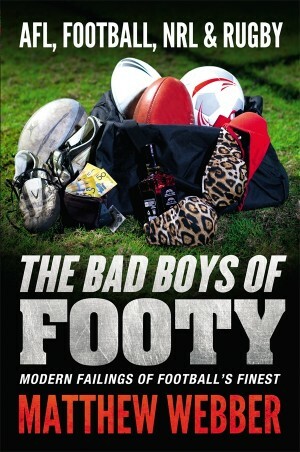 ‘Bad Boys…’ is published by Random House Australia. AFL is a ruthless game built on a more than a century of fierce rivalry, dyed-in-the-wool loyalty and unwavering tradition. 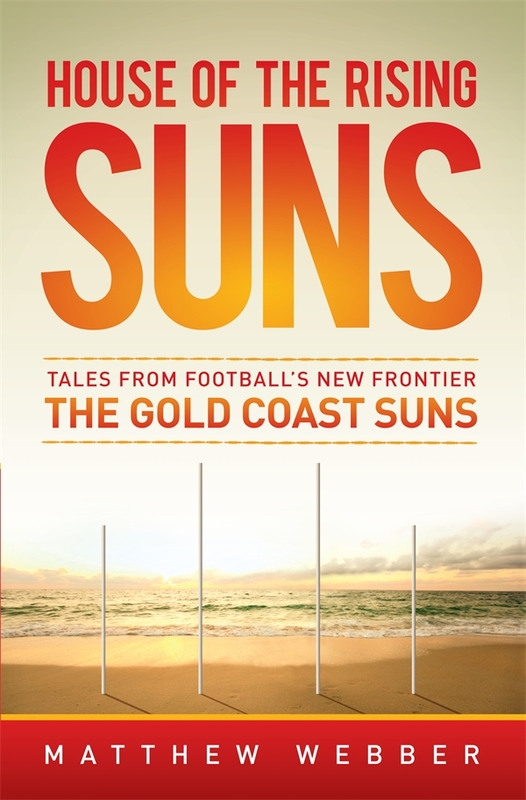 This is first and foremost the story of the group of footballers who took the Gold Coast SUNS’ first steps and the people in the outer who cheered them on. But it’s also a story about the game’s brave new frontier – a place where teams are pre-packaged, where market share is hunted, where players accept offers they can’t refuse, where impressions count for plenty, where success is all but assured and where loyalty from the little people in the outer is all part of the grand plan. And all the while the big men fly. Exciting, revealing, tragic, funny, and always coloured by the raw, unbridled emotion so unique to Australia’s indigenous code, this is the up close and personal tale of the club’s first year told through the eyes of a bloke who happened to be there at the right time. TO READ AN EXTRACT, click HERE. TO PURCHASE House of the Rising Suns in either eBook or old school form click HERE. Sometimes I have a few copies of my own to shift. Email me at mattwebberwrites at gmail dot com and we can sort something. House of the Rising Suns is published by Random House Australia.